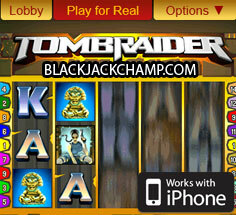 Tomb Raider mobile slot, from Spin 3, is a 5-reel, 15-payline, 5-coin game, that’s based on the popular Tomb Raider series featuring Lara Croft: the fearless gun slinging explorer always on the lookout for long lost treasure. The game symbols represent tigers, secret amulets and items familiar to fans of the movie series and the popular video game. 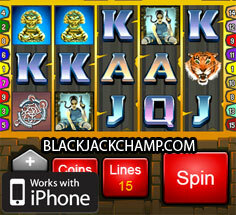 The slot is very well designed, with just about every feature that one would expect to find in a high-end video slot. 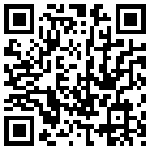 You can have a lot of fun with this excellent game at work, at home or during a long commute. There are lots of ways to win with multiple jackpots, a scatter, a wild symbol, free spin bonus game and even a bonus mini-game. The bonus game is a good place to fatten your bankroll with some excellent rewards. 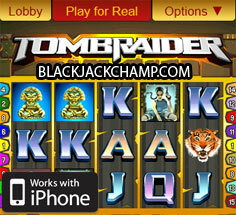 The Lara Croft symbol is the scatter which offers the greatest reward in Tomb Raider mobile slot. Five scatters pay out 30,000 coins (if you remembered to make the maximum bet), and four scatters pay out a 10,000 coin Jackpot. This is definitely a game worth playing.